My latest book, Astrophotography, is now available. You can order a copy by following this link. Astrophotography is a book of exquisite images of space, including some of the latest images such as New Horizons’ images of Pluto, Rosetta’s images of Comet 67P, and Hubble Space Telescope images of the most distant galaxies ever seen. Each stunning image, reproduced to the highest quality, is accompanied by text that I have written to explain the object, and any background science relating to the object. Astrophotography is now available. You can order your copy by following this link. One unique aspect of Astrophotography is that it emphasises the multi-wavelength approach taken to understanding astronomical objects. For millennia we could only study the Universe in visible-light (the light to which are eyes are sensitive), but for the last few decades we have used every part of the electromagnetic spectrum from radio waves to gamma rays to better understand the Universe. This multi-wavelength approach has also enabled us to discover previously unknown aspects of the Universe such as the Cosmic Microwave Background, the true appearance of Venus’ surface which lies hidden below its thick atmosphere, and huge quantities of gas between galaxies (the intracluster medium) which emit no visible-light but prodigious amounts of X-rays. Below are examples of some of the beautiful images found in Astrophotography, along with examples of the accompanying text. At the beginning of each page’s text I caption which telescope or space probe has taken the main image, and at which wavelength (or wavelengths). Two examples from the first section of Astrophotography, the section on the Solar System, are stunning images of Mercury and of Mars. The images of Mercury were taken by NASA’s MESSENGER spacecraft. There are several pages of images of Mars, the page shown below shows an image of the Martian surface taken by the Mars Curiosity Rover, and an image of Victoria Crater taken by the Mars Reconnaissance Orbiter. Images of Mercury taken by NASA’s MESSENGER spacecraft. The four main images are spectral scans, and show information on the chemical composition of Mercury’s surface. The section on the Solar System also includes images of Pluto taken by New Horizons, images of Saturn and Titan taken by the Cassini space probe, images of Comet 67P taken by Rosetta, and images of Jupiter and her moons taken by the Galileo space craft. The surface of Mars as imaged by NASA’s Mars Curiosity Rover and, at right, Victoria Crater, as imaged by NASA’s Mars Reconnaissance Orbiter. The second section of Astrophotography includes images of the Orion Nebula (Messier 42), the reflection nebula Messier 78, the Horsehead Nebula, the Pillars of Creation (part of the Eagle Nebula), and the Crab Nebula, the remnant of a supernova which exploded in 1054. The example I show below is of the reflection nebula Messier 78, and is a visible light image taken by the Max Planck Gerzellschaft Telescope, a 2.2 metre telescope located at the European Southern Observatory’s facility in La Silla, Chile. The text describes the history of observing Messier 78, and explains what produces a reflection nebula. The reflection nebula Messier 78 imaged in visible light by the Max Planck Gesellschaft Telescope. The text explains what reflection nebulae are, and the history of observing this particular object. The third section of Astrophotography looks at the Local Group, our part of the Universe. The Local Group includes our Milky Way galaxy, the Large and Small Magellanic Clouds, and the Andromeda galaxy. Some of the images shown in this section include the Tarantula Nebula in the Large Magellanic Cloud, NGC 602 (in the Small Magellanic Cloud), the Andromeda galaxy, Supernova 1987A and the Seahorse Nebula. The example I show here is the Seahorse Nebula, a dark cloud of gas and dust located in Large Magellanic Cloud. This Hubble Space Telescope image was taken in 2008, and the nebula is in the bottom right of the image. The Seahorse nebula is a dark cloud of gas and dust found in the Large Magellanic Cloud, an irregular galaxy visible to the naked eye and in orbit about our Milky Way galaxy. The seahorse nebula is in the bottom right of the image. The fourth section of Astrophotography looks at the rich variety of galaxies found beyond our own neighbourhood. Examples are galaxies like Messier 82, which is undergoing a huge burst of star formation in its centre, Centaurus A, which shows huge lobes of radio radiation stretching far beyond the stars we see in visible light, colliding galaxies such as The Antennae galaxies, and evidence for dark matter such as the Bullet cluster. The example I have shown here is the spread for Messier 81, a beautiful spiral galaxy found in Ursa Major. It is one of the best known galaxies in the sky, and is visible to northern hemisphere observers throughout the year. The main image illustrates the multi-wavelength approach astronomers take to studying many objects. The image combines visible light, infrared light and ultraviolet light to teach us far more about the galaxy than we would learn if we only looked in visible light. Messier 81 is a beautiful spiral galaxy found in Ursa Major. Hence it is visible throughout the year to northern hemisphere observers. The main image shown here is a combination of of a visible light image (taken by the Hubble Space Telescope), an infrared image taken by the Spitzer Space Telescope, and an ultraviolet image taken by Galaxy Evolution Explorer (GALEX). In the final section of Astrophotography, I show examples of some of the most distant objects known. Images include the Hubble Deep Field, the Cosmic Microwave Background, the most distant galaxy seen (GN-z11, lying about 13.4 billion light years away), gravitational lenses and the recent discovery of gravitational waves made by LIGO. The example I show here is the spread about the gravitational lens SDP81, a galaxy lying about 12 billion light years away which is being lensed (and brightened) by an intervening cluster of galaxies which lie about 4 billion light years away. The top image was taken at millimetre wavelengths by the Atacama Large Millimetre Array (ALMA), the bottom image in visible light by the Hubble Space Telescope. Gravitational lenses enable us to see distant galaxies which would otherwise be too faint to see, but they also provide us with a way of tracing the distribution of dark matter in clusters. I hope these few examples from Astrophotography have whetted your appetite to find out more. I really enjoyed putting the book together, and am very pleased with the quality of the images and their aesthetic beauty. Christmas is nearly here, and I have to say that Cardiff makes a pretty good job of decorating its streets and buildings with lights. Here is the castle, which is right in the centre of the city. In the Disunited Kingdom, there is a superstition to remove Christmas decorations by “Twelfth night”, which is January the 5th. In the USA, where I lived for 9 years, no such tradition seems to exist which means that people often leave their house decorations up until late January, which I liked as it helps brighten the dark days of December and January. 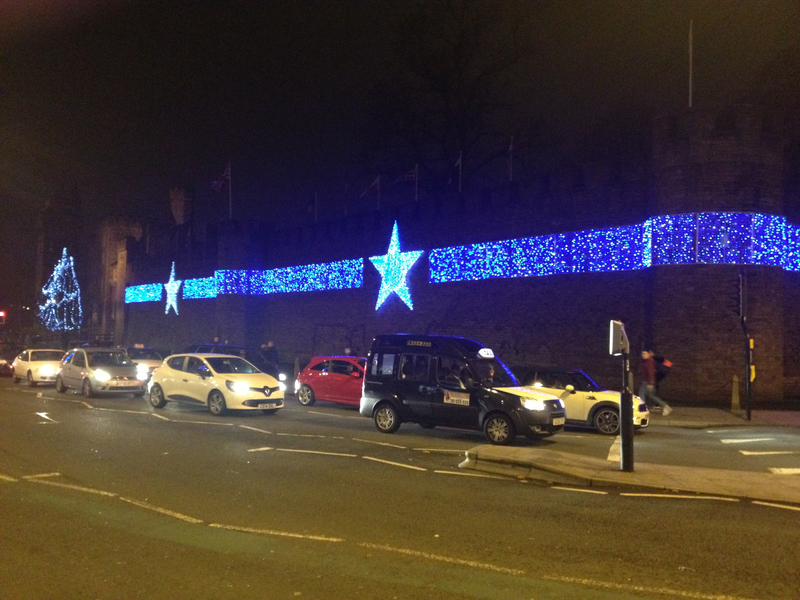 Here is a gallery of some of Cardiff’s decorations. Enjoy! What is your favourite tradition at Christmas time? I first visited le Mont Saint Michel the day after the total solar eclipse which passed through Normandy in August 1999. It would seem that most of the people who had flocked to Normandy to see the eclipse had had the same idea, I don’t think I have ever been in such a large crowd before, and sadly it made moving around the island at one’s own pace impossible. 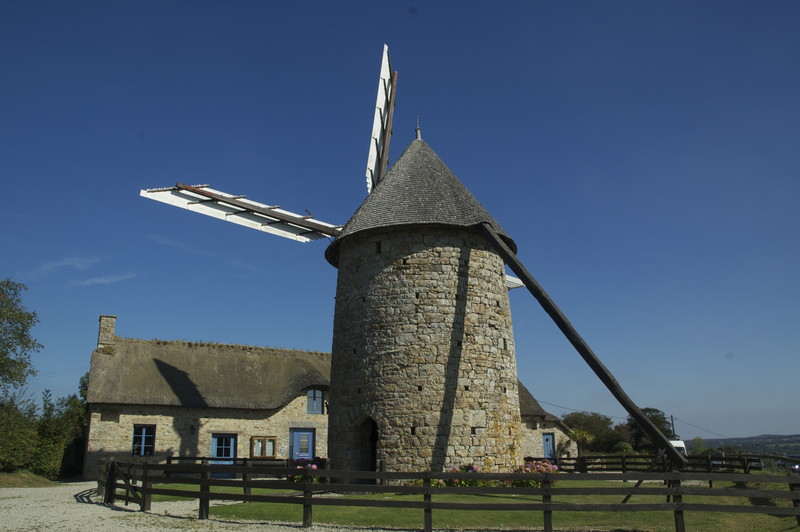 Since that visit, I have been back to le Mont Saint Michel twice, but have not been back onto the island itself in either of these two more recent visits. When I was there in 1999, one could drive one’s car quite close to the island and just park somewhere on the side of the road, but things have changed. Now, there is a large car park with a visitor centre about 1.5km from the island, and no cars are allowed any closer than that. To get to the island you can either walk, or take one of the free shuttle buses which run every 10 minutes or so. Between this car park and the island are some shops and galleries and eating places. 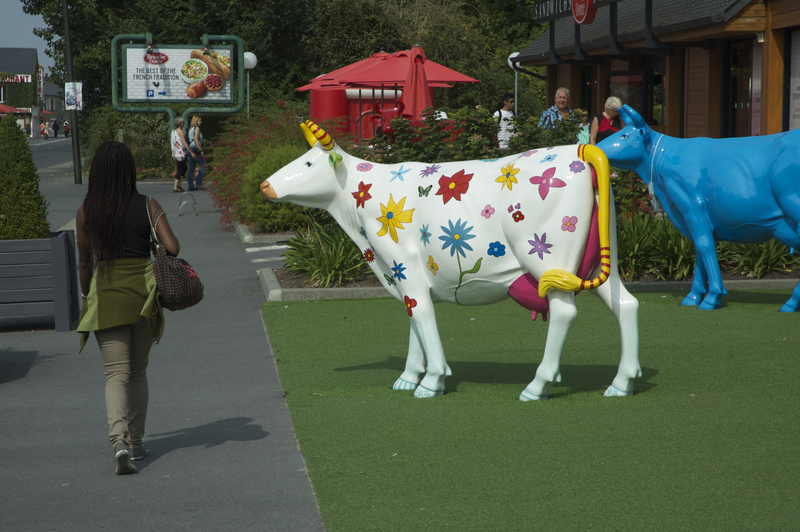 There are also these “pop cows”, which certainly brighten up the place!